Chicago Mayor Rahm Emanuel Apologizes For Police Killing Of 17-Year-Old : The Two-Way The 2014 police shooting of Laquan McDonald "happened on my watch," Emanuel said in an emotional speech. He promised to address issues of supervision and leadership within the police department. Chicago Mayor Rahm Emanuel speaks during a special City Council meeting Wednesday in Chicago. Emanuel called the meeting to discuss a police abuse scandal and apologized for the 2014 shooting of a black teenager. Chicago Mayor Rahm Emanuel has apologized for the death of Laquan McDonald, the black 17-year-old shot 16 times by a Chicago police officer in 2014. 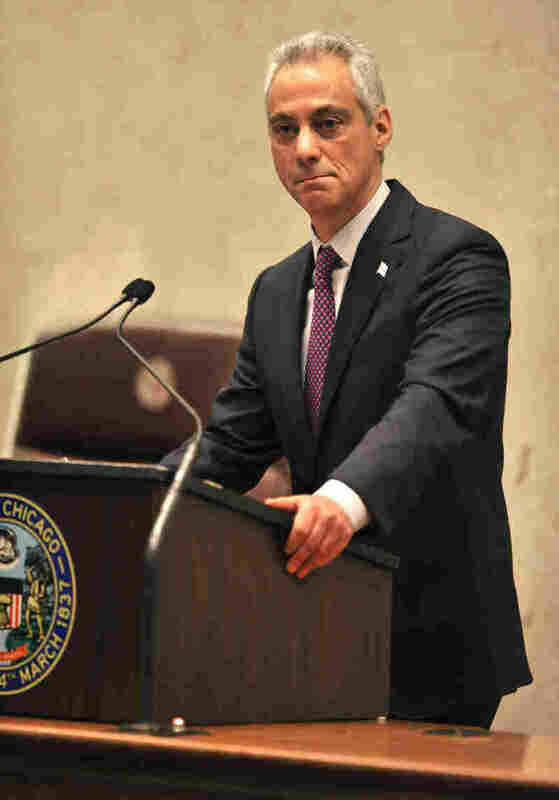 "That happened on my watch," Emanuel said in an emotional address to a special meeting of the Chicago City Council on Wednesday, NPR's David Schaper reports. "I'm sorry," the mayor said, promising "complete and total reform of the system." The Justice Department announced this week that it will be investigating the use of force by Chicago's police department, looking for a pattern of unconstitutional or discriminatory behavior. Protesters have been calling for an outside investigation — and for a greater sense of urgency from local and national leaders — since McDonald's death gained national attention this fall. Dashcam footage of the Oct. 20, 2014, shooting had been withheld from the public for more than a year. When it was released Nov. 24 following a judge's order, it showed a version of events that differed strongly from statements by police, according to reports late last week. "Emanuel says supervision and leadership in the police department failed, and he promises to address 'the thin blue line' and 'the code of silence,' in which police officers ignore, deny and cover up the bad actions of a colleague." After the mayor's speech, hundreds of protesters took to the streets near City Hall, the Associated Press reports — the latest in a string of protests since the video of the shooting was released. Monica Eng, a reporter at member station WBEZ, reports that it's been a peaceful protest, with one tense moment at City Hall when police and protesters faced off at the doors. But the situation didn't escalate, and the march moved on toward the Magnificent Mile. Some city workers took their lunch hour to join in the protest, Monica reports. The crowd is chanting "impeach Rahm," "Rahm resign" and "Rahm must go," Monica says, as well as "too little, too late." A retired teacher at the protest told the wire service that Emanuel's apology was "politically expedient" and that she'd rather hear a resignation speech.